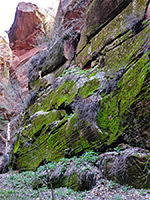 The narrows of Beartrap Canyon are only a quarter of a mile long, but deep and very pretty, framed by vertical, reddish walls of thin-layered Navajo sandstone, covered in places by bright green moss and orange lichen, and they lead to a large pool at the base of a forceful, 20 foot waterfall, above which the canyon is still deep though significantly wider. 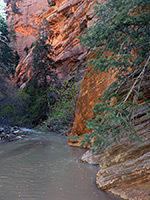 This remote drainage is an upper tributary of La Verkin Creek, towards the north side of Zion National Park, between Bullpen Mountain and Langston Mountain, and the lower end, containing the slot canyon, is explorable by walking up the main creek, starting at the Lee Pass trailhead in the Kolob Canyons region of the park - a recognizable path leads all the way along this canyon, continuing up another tributary (Willis Creek, usually dry), and ending at a fence at the park boundary, which here adjoins private land. 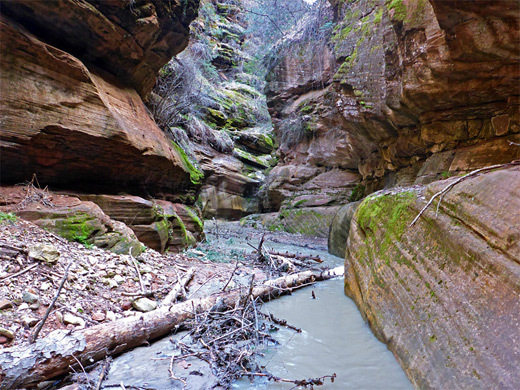 In Beartrap Canyon the stream covers most of the canyon floor but walking is still relatively easy as there are no obstructions, until the unclimbable falls. Overall the hike is tiring, however, because of the distance; the waterfall is 8.8 miles from the trailhead, though still within range of all-day hiking. Most of the few visitors who see the canyon camp overnight, at one of 13 primitive campsites along the route, the closest just downstream of the confluence. 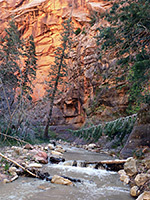 One option for a more extended hike is to walk further up the trail, nearly to the upper end of Willis Creek, turn south across a low divide and descend into the upper reaches of Beartrap Canyon, following this downstream back to La Verkin Creek; this trip requires use of ropes, in order to descend the waterfall. 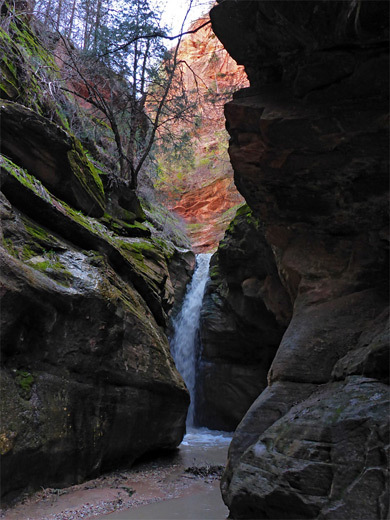 The La Verkin Creek Trail is well used for the first 6.7 miles, as far as the short spur to the viewpoint of Kolob Arch, then much less busy for the third of a mile to the junction with the Hop Valley Trail, which forms the next section of the long-distance trans-Zion route. The path further up the canyon sees even fewer visitors. 32 views of Beartrap Canyon. Scenes in the slot canyon. 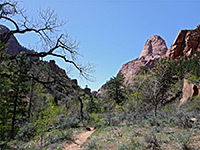 The start point for the hike to Kolob Arch, La Verkin Creek and Beartrap Canyon is Lee Pass, at the top of a minor divide along Kolob Canyons Road. The path begins with a gradual descent into the valley of Timber Creek, initially traversing sloping ground then moving right beside the shallow stream that usually flows below. 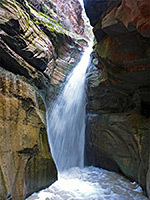 It leaves the creek after 3 miles, rising over a broad, wooded saddle and dropping down the far side to the larger La Verkin drainage, meeting it just upstream of a powerful cascade between fluted red rocks. 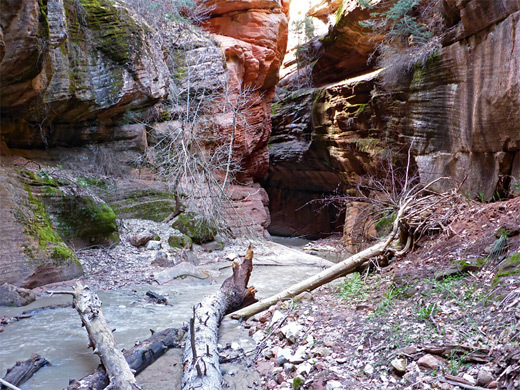 The next 3.5 miles are all along the valley floor, staying on the north side of the creek until shortly after the Kolob Arch spur path, where the main trail crosses to the south and rises slightly to the Hop Valley junction. At the Hop Valley junction the onwards route is signed as the Willis Creek Trail, and the distance to the park boundary given as 4.5 miles. The path, narrow but still easy to follow, descends a little and crosses a pretty stream (originating in the valley to the south) flowing beneath a huge boulder with a trickling waterfall, and over several sandy terraces. Just after here is the next of many more stream crossings, usually with logs or boulders to assist, though at high water levels wading might be necessary, the stream then up to 2 feet deep. A prominent, protruding cliff is passed to the east, followed after another 20 minutes walking by another to the west, this just after the junction with an unnamed tributary; here the canyon turns to the east and is noticeably narrower, the waters often flowing against the base of sheer cliffs at one side or the other. A faint trail persists, on the bushy banks beside the stream, sometimes climbing slightly to pass obstructions. The water depth gradually lessens, up to the Beartrap confluence, where each drainage supplies about half the flow. For people staying overnight, camp 13 is the closest, a few hundred feet downstream. 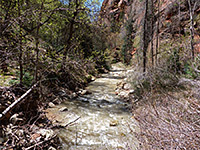 The stream in the lower end of Beartrap Canyon is still partly bordered by sand and pebble banks, initially large and permanent enough to support trees and bushes, so walking remains straightforward and the stream is usually just a few inches deep. The walls are vertical from the start and sometimes overhanging, the Navajo sandstone colored rich shades of red and orange. The edges of the creek are lined with a mix of pebbles, reddish sand and slippery, greyish mud. 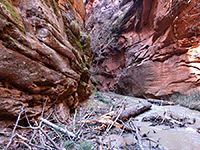 Logs and branches litter the canyon floor, either washed down by floods or fallen from the slopes high above. The ravine narrows after a few hundred yards and the vegetation fades away, then after a dark corner and a minor cascade, the way ahead is blocked by the pool and waterfall.